On Tuesday, the final big day for Democratic primaries took place with the last states voting in California, North Dakota, Montana, New Jersey, New Mexico, and South Dakota. (Democrats will have one final primary in D.C. on June 14.) The combined pool of pledged delegates from Tuesday's six voting states amounted to a total of 694, and California alone allocated 475 of them. With the primaries behind us — and how quickly they came and went — how many delegates did Bernie Sanders win in California? California's polls closed at 11 p.m. ET. Their primary was semi-closed, meaning that anyone of voting age who is registered as a Democrat or without a preferred party, was able to vote in California's primary. California's pledged delegates were allocated proportionally, and as of Wednesday, Vermont Sen. Bernie Sanders won 188 of the state's 475 delegates. On the other hand, Hillary Clinton, whose nomination was declared prematurely on Monday night by the Associated Press, won 257 delegates. So what does this all mean for Sanders, the Democrats, and the future of this country's leadership? 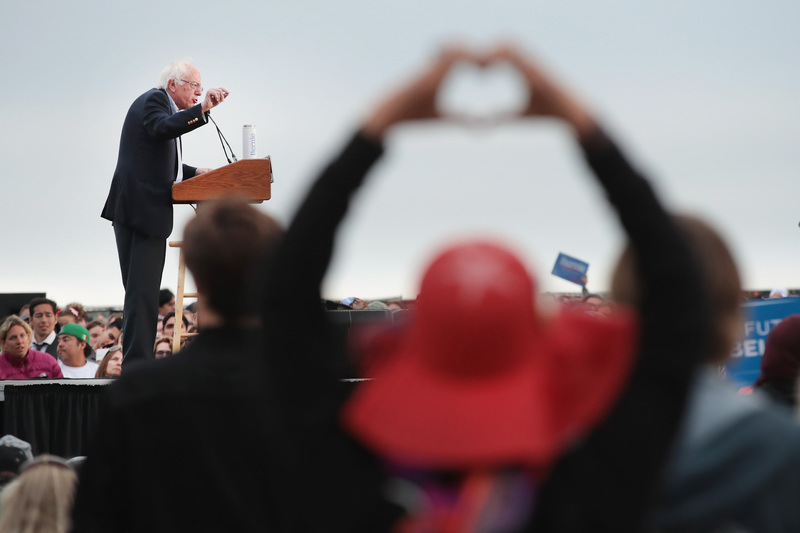 For Sanders, it's still unclear if this is the end. The Vermont Senator has said that he intends on taking his campaign to a convention no matter what, in order to win over the superdelegates who have already pledged their allegiance to Clinton. However, even the odds of Sanders coming out on top at the Democratic Convention are slim to none. For the Democratic party broadly, it appears that the primaries ended the way they were intended to. Sanders was never the favored candidate among the establishment, and the delegate math often portrayed by the media was ambiguous enough to sway voters away from his campaign. However, Philadelphia organizer Gary Frazier told CNN last week that if Sanders didn't win the nomination, that "we are prepared to de-register from the Democratic party." For the nation as a whole, until we hear more from the Sanders camp about their plans moving forward, it would appear that the 2016 general election will be between former reality TV star Donald Trump, and Hillary Clinton. One has has made a series of dangerous statements about what he would do to Muslims if he wins, and the other already has a record of backing a number of violent militaristic campaigns against the same population. Who ends up in the White House is ultimately up to you.